HMB Supplement Review: Shortcut For Muscle, or Waste of Your Money? A HMB supplement (formally called β-Hydroxy β-Methylbutyric acid) is one of the few muscle building supplements that actually works. I use it, along with creatine, when I want to build muscle fast. But simply, HMB is one of the few supplements that's worth the money. 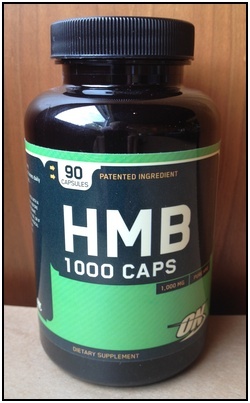 HMB is used by your body to make the essential branched chain amino acid (BCCA) leucine. Your body makes some on its own, but taking an HMB supplement makes it much easier for your body to synthesize leucine. HMB also helps slow down proteolysis, the process of muscle protein breakdown after a stressful activity. Slowing this down is really helpful for athletes like us! So, taking HMB helps stop protein breakdown and helps you build muscle from leucine. Both great benefits. The wonderful thing about a HMB supplement is that there're sound scientific reasons why it works. I put my trust in that science. "Although not conclusive, it appears that HMB supplementation does suppress protein breakdown, ultimately leading to increased lean body mass [muscle] in some individuals. Following carbohydrate supplementation (for the purpose of secreting insulin), HMB is the next best anticatabolic sports supplement." Eating carbohydrates to stimulate an insulin response is a proven way to stop muscle breakdown after exercise, and help you build more muscle mass. Saying that after carbohydrates a HMB supplement is the next best thing is high praise indeed. "HMB has been the subject of extensive clinical study. … [HMB] has been shown to improve performance in placebo-controlled studies with experienced resistance-trained adults." HMB works, unlike most of the drek on the market. And what about HMB side effects? I haven't heard of any, and I've taken HMB several times myself and never experienced any. So, no side effects. The combination of HMB and a creatine supplement is interesting, since they are the top two muscle building supplements on the market. And you know what? They stack great! Individually, HMB and creatine both work to build your muscles. But when you combine these two supplements, they synergize! The results of combining them far outweigh the benefits of taking either alone. "In summary, CR [creatine] and HMB can increase LBM [lean body mass, i.e. muscle] and strength, and the effects are additive. Although not definitive, these results suggest that CR [creatine] and HMB act by different mechanisms." The fact that HMB and creatine together stack so well for muscle building indicates that they use different methods to spur muscle development! This is interesting for scientists and physiology geeks like me, but it's also cool simply because now you know that taking HMB and creatine together give you more muscle building potential than just taking either individually. In most of the studies, the dosage to show an positive muscle growth effect was 3 grams. Which is, most times, simply 3 pills a day (HMB powder isn't very common). If you workout that day, take HMB right after your workout. Taking supplements doesn't get much easier than this. The bodybuilding supplement HMB is cheap. A bottle of HMB tablets for a month is usually around $30, which is way cheaper than most other sports supplements. HMB works, as long as you also do quality, intense weight training. You don't need to swallow a ton of pills or use special timing. Just 3g a day. Need I say more? Try it! • Click here to leave 'HMB Supplement Review: Shortcut For Muscle, or Waste of Money?' & go back to the Home-page! HMB Supplement Review: Shortcut For Muscle, or Waste of Money? 1. Greenwood, Mike, Douglas Kalman, and Jose Antonio. 2008. Nutritional Supplements in Sports and Exercise. Totowa, N.J.: Humana. Pp. 340. 3. Llewellyn, William. 2009. Sport Supplement Reference Guide. Jupiter, FL: Molecular Nutrition. Pp. 111. 4. Jówko E, Ostaszewski P, Jank M, Sacharuk J, Zieniewicz A, Wilczak J, Nissen S. Creatine and beta-hydroxy-beta-methylbutyrate (HMB) additively increase lean body mass and muscle strength during a weight-training program. Nutrition. 2001 Jul-Aug;17(7-8):558-66. PubMed PMID: 11448573. Pp. 558.